The SCCA Pro World Challenge season starts this weekend in St. Petersburg, Florida. 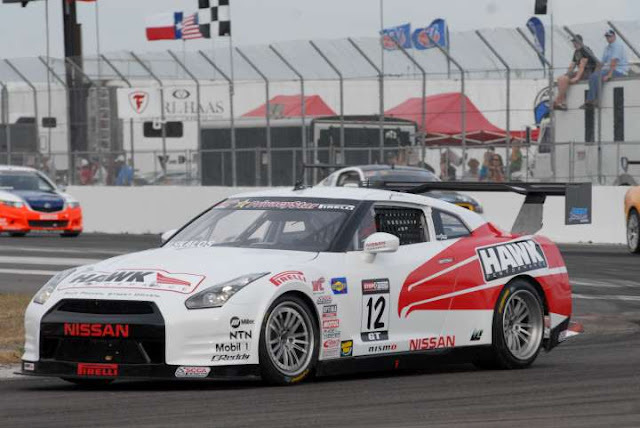 The CRP Racing backed - Hawk Performance Nissan GT-R will have Tim Bell at the helm. The Nissan GT-R hasn't managed to have much success in World Challenge, lets see how it goes this year. You can watch the races streamed live, the first race at 4:35 pm EST Saturday, with the second race at 10:10 am EST on Sunday. Harrisburg, NC - CRP Racing is pleased to announce they have signed Mike Skeen for a third season in the Pirelli World Challenge series. Skeen, of Charlotte, NC, is a veteran driver in the PWC series having 6 wins and numerous podiums since his debut World Challenge race at Mid-Ohio in 2010. “I’m happy to be back with CRP Racing and Hawk Performance this year. We have made some changes to the car and I know 2013 will be a great year for us in World Challenge,” says Skeen. Skeen began racing karts at the age of 10 and gained experience across many platforms. He has had success on ovals and road courses, driving everything from shifter karts and formula cars, to GT and touring cars of all types. Most recently Skeen finished 6th in the Vess Energy Porsche GT3 at Circuit of the Americas in the Grand-Am Rolex Sports Car Series. “We’re very happy to have Mike racing with us again as we truly believe he is one of America’s finest race car drivers,” says Nick Short, owner of CRP Racing. Getting his start in Kart racing, Bell broke into the pro-circuit by taking 1st regionally and 4th nationally in the D-Mod Class BMW in 2009 and continued his ‘09 trek at several track events including Hooked on Driving, NASA, NCRC, Checkered Flag, Speedventures and Skip Barber Racing School. This led into a full season in 2011 racing the BMW 128i in the Continental Tire Sports Car Challenge and in 2012 Bell drove a full season in the same series in the Chevrolet Camaro GS.R. Additionally, he drove in the Late Model/NASCAR Whelen Series Creation Cope Racing and has competed in the K&N Pro Series. CRP Racing is a leading edge race car engineering company with a winning pedigree that offers full service race car prep, full track set-up, restoration and custom fabrication, and shock, dyno and design services. Owner Nicholas Short has made a career out of motorsports with experience in IndyCar, NASCAR, Trans-Am, Group C Endurance Racing, Baja desert racing, Vintage SVRA and HSR and the World Challenge series. CRP Racing plans to not only have a winning team, but one that is fan-oriented as well. Updates from the track, videos (including exciting in-car footage), and photos will be posted each race weekend at www.CompetitionRaceParts.com and the CRP Racing Facebook page. The team invites fans to stop by the transporter at all World Challenge. The Pirelli World Challenge schedule will kick-off at the Honda Grand Prix of St. Petersburg. The race is run through the streets of downtown surrounding the marina and the Albert Whitted Airport. The World Challenge Series, race one, will be at 5 p.m. on Sat. Mar. 23 with the second round on Sun. at 10:25 a.m. The races from St. Pete will be televised on NBC Sports, Sun., Apr. 7 at 12:30 p.m. EDT. Live streaming can be viewed on www.world-challengeTV.com day of races.